No prior knowledge of previous Tex Murphy games is required for the new and upcoming game. But for those who are interested here is some info. 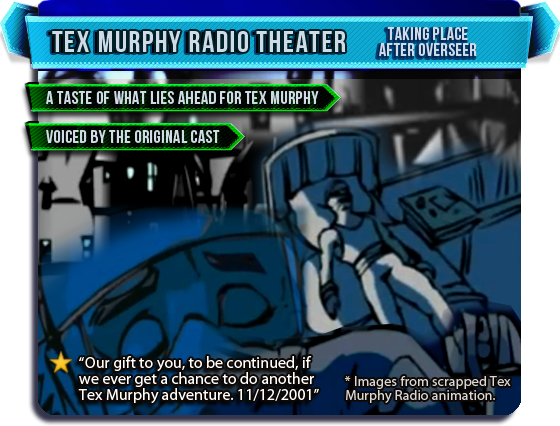 Tex Murphy is a series of adventure games which began in the 1990s but came to a halt near the end of the decade and is being revived through Kickstarter, a crowdfunding site, through the support of the consumer rather than through a publisher. Right now the game has been funded so you can consider a donation on Kickstarter pretty much like a preorder for a fully confirmed game but with many more rewards than will be available upon public release. Any funds past the initial goal will go towards making the game bigger and better (see the details on stretch goals here). Any questions don't hesitate to ask on the Kickstarter page (via Send Message), the Unofficial Tex Murphy fansite forum or the Steam Group. All previous games can be found on Good Old Games. Banners by HybridWing Design. For a great video overview from a fan, you can check out the testimonial from James LeMosey which talks about what they find appealing about the gameplay and story in the Tex Murphy series. After the devastating events of WWIII, many major cities have been rebuilt (such as New San Francisco), though certain areas still remain as they were before the war (as in Old San Francisco). The events of WWIII left the planet with no ozone layer, and to protect their citizens many countries adopted a time reversal. Instead of sleeping at night, and being awake in the day, humans have become mostly nocturnal, in a manner of speaking. WWIII also left another mark on the world: the formation of two classes of citizens. Specifically, some people have developed a natural resistance against radioactivity, and thus are normal or "Norms" - everybody else are Mutants in some form. Tensions between the two groups rose dramatically after the end of the war, leading to "Genetic Purity" groups. The Mutants were forced to live in the run-down areas of cities such as Old San Francisco. The end of the most influential anti-Mutant group was a turning point in relations however and animosity diminished, though still "Mutants" and "Norms" often don't get along easily. Tex lives on Chandler Avenue in Old San Francisco. All his friends are "Mutants", though he is a "Norm". A series of high-quality fan-made videos which updates the look of and touches upon themes from previous Tex Murphy games in the form of a newsreel. Such as the Moon Child escapade from Under A Killing Moon and the mysteries of aliens within The Pandora Directive. Tex Murphy is a down and out private investigator, an avid fan of the classic film noir films of Humphrey Bogart. As such, he does his work in the style of archetypal film noir detectives such as Sam Spade and Philip Marlowe. Despite his futuristic surroundings he is a man out of time who enjoys giving dance lessons using an old phonograph and receiving messages through an aging fax machine. His only modern concession is the pair of comfy sneakers he wears in place of the traditional wing tips. Tex can handle the futuristic machinery, such as travelling to locations using his flying "Speeder" car or interrogating people through a VidPhone, but simply feels more comfortable with objects from a simpler time. He has remarkable skills of observation (punctuated with humorous internal monologues); when examining objects or features, he hardly ever misses an important or unusual detail. However, he is also occasionally a bit clumsy and naive which gets him into trouble from time to time, as does his sarcastic wit. Tex doesn't fall into the typical "super hero" category, but usually manages to succeed in saving the world regardless by making the right calls and doing the right thing. He is honest and generally a good-natured fellow who suffers from a few too many blows to the head. Tex is divorced and perpetually broke. Aside from wishing for a respectable, not to mention high-paying, client all he'd like to do is earn the love and respect of his love interest, Chelsee, if he can just refrain from placing his admittedly not too bad smelling foot in his mouth. Chelsee Bando: She runs the News stand across the street from Tex's office. Like most on Chandler Avenue, Chelsee is a Mutant, but it doesn't show. In fact, nobody knows what her mutation actually is. Chelsee has a way of turning Tex's knees to jelly, and he's been trying to get a date with her since their first inauspicious meeting. At the end of Tex Murphy: Overseer things between them were looking up until tragedy struck. Louie LaMintz: The owner of the popular Brew and Stew cafe. He has a heart as big as his waistline. Louie is probably Tex's best friend, if he has one, and is always willing to let Tex run up a tab of epic proportions. Rook Garner: The owner of Rook's Pawn Shop, a crusty old WWIII vet with a mean streak longer than his lifeline and a particularly antagonistic attitude towards Tex. Nilo Paglio: The smelly, disgusting, cheap cigar smoking owner/landlord of the Ritz Hotel would evict you on the day of your mother's funeral if your rent wasn't paid. Clint: Formerly a chocoholic bum living in a dumpster behind Rook's Pawn Shop, Clint was last seen as a chocoholic bum with his own chocolate stand: The Cocoa Cabana. After the Cabana opened every day at 9:00, everything on the menu had been mysteriously eaten by around 10:30. Tex Murphy's home street situated in the rundown 'Old San Francisco' area where primarily "Mutants" reside. Tex feels more comfortable around those who have been shunned and rejected, but he tells his clients (the few that he manages to get) that he lives there because the rent is cheap. Tex's office and home is situated at the Ritz hotel with a handy fire escape to exit straight out onto the street to avoid his repugnant landlord. Then the Electronics Shop with the latest gadgets is just a step away, if you have the right membership. 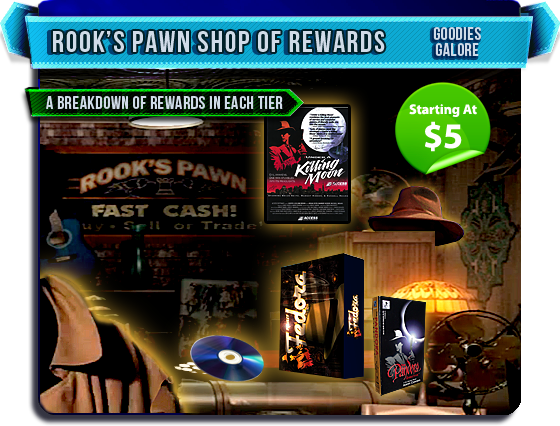 Across from the Ritz is Rook's Pawn shop and Chelsee's news stand, both good for a banter. Whilst on one end of the street Louies Brew and Stew diner and the Slice O' Heaven pizza parlour offer variable qualities of dining. The firetrap Golden Gate Hotel and abandoned Rusty's Fun House reside at the other end of Chandler Avenue with the Fuchsia Flamingo nightclub shining brightly. Throughout Tex Murphy's many escapades he has had to travel far away from his home street of Chandler Avenue. 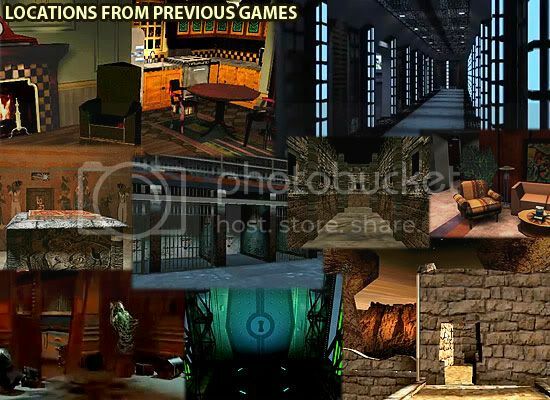 Including ancient ruins, abandoned buildings, isolated cabins, organization headquarters, old warehouses, underground military bases, lofty apartments, disgusting sewers, secret labs, perilous rooftops, deep jungles, disused prisons, dark alleys, police stations, space stations, mansions and many more locations. In his next big adventure he is sure to broaden his horizons further. Words from the developers from Interviews. Throughout the Tex Murphy series we have developed and fine-tuned a quintessential detective engine. A video message from the developers on gameplay. Roaming 3D Environments: You are thrown into an environment and you have to be able to freely move around and look under desks, look in drawers, move mattresses. You have to be able to do things a detective would be doing. Close Inspection Look closer in the environment and rummage for clues by delving into drawers, discovering new clues or items to examine and put together using the inventory system to create solutions to problems. Diverse Dialogue Choose from a variety of responses when interacting with people in the game, which are summarized so that the resulting dialogue stays fresh and fun. Multiple Endings Interactive storytelling makes it possible for the player to basically create the character of Tex through the choices they make. Whether they prefer a lighthearted good guy, or a much darker, selfish anti-hero. Puzzles A lot of logic puzzles, lateral thinking puzzles. For instance, if you have to get inside a locked building, how are you going to deal with that? How are you going to put the elements together? 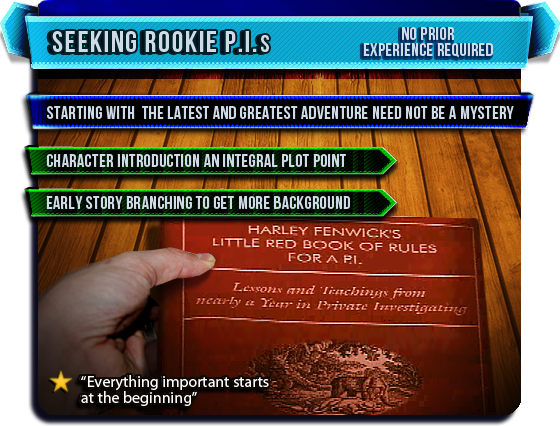 Plus easily accessible optional hints so players can keep moving through the game. Monologues Almost every object can be looked at resulting in funny or insightful comments from Tex Murphy. Interface Its nice to be a retro product but we also realise that techniques have improved and those really have to be built into what we're doing. With our heritage we like to push the envelope in making the game more enjoyable. The core of the gameplay will be the same including searching locations, combining objects, interviewing suspects, interacting with friends and not-so-friendly people, cinematic sequences and more. However, we hope to streamline the interface and make it more intuitive and easier to play. Ultimately however, it will remain true to our past games with two levels of game play difficulty with one level designed for challenging Gamers and an easier Entertainment mode (as seen in The Pandora Directive). To learn more, check out the testimonial from James LeMosey which talks further about the gameplay and Tex Murphy in general. 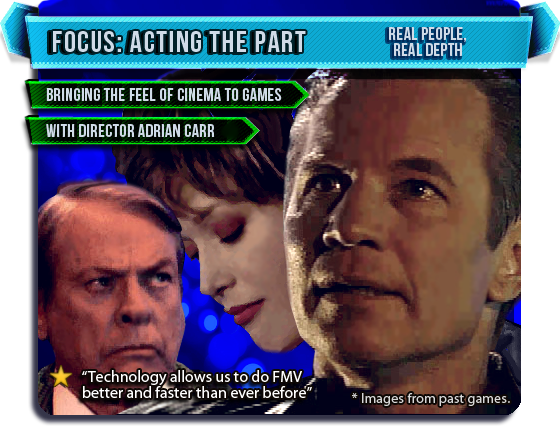 We understand there were games which completely missed the point of why, in our opinion, FMV can be a legitimate family member to games. Which is to really take advantage of being able to show a full range of human emotion, relationships and interaction. This impact of live actors is something that is still widely seen and accepted in film and cinema today. Though CG can show emotion too, especially with today's technology, we still feel there is that opportunity to return a real human element and bond between characters and the audience using live actors to portray depth of character to the maximum degree human being to human being. Technology allows us to do FMV better and faster than ever before. Our director, Adrian Carr, has brought experience, education and a level of professionalism from a true filmmaker. By the time we made our last Tex Murphy game, Overseer, we were in full stride creating a cinematic experience for the game players and in creating a new Tex Murphy game the opportunity is there to develop the cinematic experience further. We understand there was a novelty factor to the early FMV games that quickly wore off and won’t be suffered lightly today. If we exceed our goal by more than 20% it will give more opportunity to cast some very recognisable names. In the past some of the known actors to of graced the Tex Murphy series include: Michael York, James Earl Jones, Kevin McCarthy, Tanya Roberts, Barry Corbin, Henry Darrow, Richard Norton and many more! 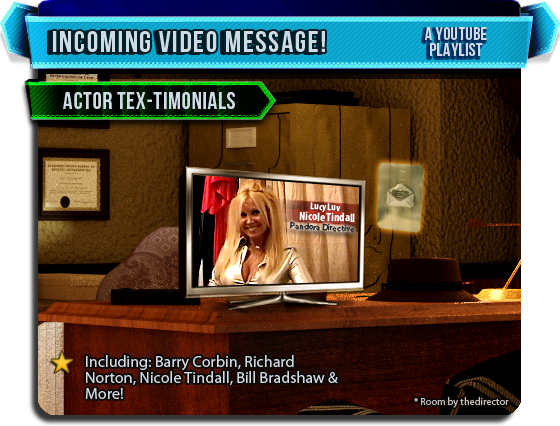 Video messages from actors supporting the Kickstarter. “Project Fedora” will continue the amazing adventures of Tex Murphy, the down-on-his-luck P.I. in post-apocalyptic San Francisco. Reuniting creators Chris Jones and Aaron Conners. The game will be just as enjoyable for people who have never played the earlier games. It will feature Chris and Aaron's trademarks of rich interactive storytelling and immersive gameplay. The new game will incorporate the very best of the classic Tex Murphy elements - sci-fi, film noir, witty dialogue, great characters, beautifully integrated FMV, and a deep, engaging story - but it will also enhance the experience of the former games with stunning new graphics, a sleek new interface, and other updates. An exciting feature will be how the game and story can unfold in different ways. As you play, your actions and choices will change events, leading to new story elements and gameplay. 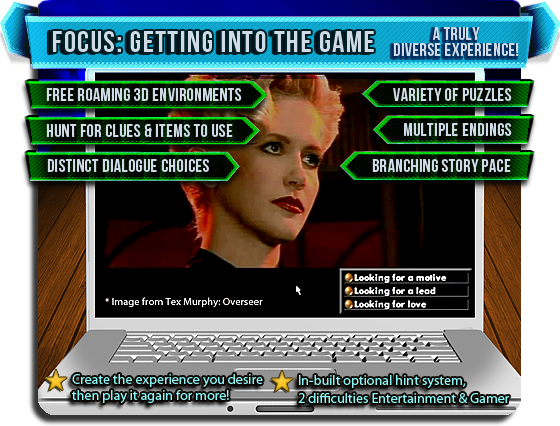 This "narrative pathing" not only allows you to customize your experience, it will provide unique replayability, as the game will have at least three or more story paths leading to multiple endings. While we can't give too many details yet, just be prepared for an incredible opening sequence! Any funding past the initial goal will go directly into the game development. See the announcement on stretch goal details from the developers here. A taste of what is to come: English, Spanish and French Subs on Youtube | More Episodes. We've been looking over the years at many different processes in order to get funding or to actually and to resolve our cliffhanger which appeared at the end of Overseer. It was our plan to do another Tex Murphy game 12-14 months after Overseer (note this cliffhanger was just a 5 minute preview/lead-in to the next game at the very end of Overseer and not related to the rest of the Overseer game/story, so newcomers to the series will not need to of played Overseer). At that time we had sold the company [Access Software] to Microsoft, we felt there was a good opportunity to continue the series and we were looking forward to that. As things progressed however Microsoft understandably changed focus to XBox games as they were of course the manufacturer of XBox. Back then it was felt that Tex Murphy was not a good match for an XBox product. Then we looked at their online service and felt that could possibly work, unfortunately for a of number reasons it fell through. In 2004 we left Microsoft and started looking into other opportunities again. We approached another Canadian company about continuing the series and one of the difficult questions that hit talks was whether to do FMV or CGI for the characters. We could never really come to an agreement. Then we started Big Finish Games, where we looked try to establish ourselves in the gaming market through casual games first and later swing production over to more of an adventure feel. However it proved difficult to transition as we found adventure mechanics just weren't as successful in a casual market. Tex Murphy does not fit a casual format, so after we finished our last casual game "Race to Shangri-La", we decided to try again. Coincidentally Kickstarter had then started to look like an opportunity to get funding in a different way that bypasses the difficulty we have found in approaching publishers. The Kickstarter is powered by Amazon payments system, so if you have an Amazon account with a payment method on it you can use that easily. There is also a PayPal page available to use. Or many other options which don't require a credit card.